No longer are our magnificent Monday night ‘Heroes’ going to be confined to merely mortal NBC TV (and SciFi Channel reruns). Our favorite Heroes and villains are coming to DVD this August with tons of bonus features. The 7-disc set, available on DVD and HD DVD on August 28, 2007, will include the never-before-aired 73-minute premiere episode and over 50 deleted scenes. 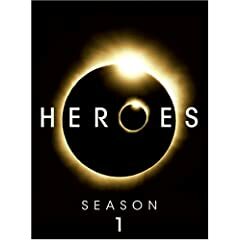 The Heroes Season 1 DVD set is priced at $59.98 and is available for preorder on Amazon.com for $38.99 until July 24, 2007. Unaired Pilot: The Tim Kring cut with audio commentary — A full 73 uninterrupted minutes of the original, unaired, extended pilot episode, as Heroes’ creator Tim Kring first envisioned it, with a character never seen. The Making of “Heroes”: From concept to pop culture phenomenon, a behind-the-scenes look at the hottest new series on television. Special Effects: The secrets behind the eye-popping visuals that give the Heroes their amazing powers. The Stunts: A backstage look at the show’s hair-raising stunts. Mind Reader: Matt Parkman’s mind reading abilities reveal your inner Hero with a series of simple tests. Profile of Artist Tim Sale: A look at the Eisner Award-winning comic book artist (Spiderman, Batman, Daredevil) behind much of the Manga-influenced artwork used in the show. The Score: Go behind the scenes with Wendy Melvin and Lisa Coleman (of Prince’s The Revolution) as they create their ASCAP Award-winning musical score. Extra Scenes: 50 deleted and extended scenes. This entry was posted on Tuesday, May 29th, 2007 at 3:55 pm	and is filed under Uncategorized, Heroes, Sci Fi Channel. You can follow any responses to this entry through the RSS 2.0 feed. You can leave a response, or trackback from your own site.